Performers include: Parker Posey, Molly Parker, Toby Stephens, Taylor Russell, Mina Sundwall, Maxwell Jenkins, Ignacio Serricchio, Amelia Burstyn, Raza Jaffrey, Ajay Friese, Adam Greydon Reid, Kiki Sukezane, Iain Belcher, Yukari Komatsu, and Sibongile Mlambo. From Matt Sazama and Burk Sharpless, the Lost in Space TV show is a remake of the classic 1965 Irwin Allen series of the same name. The sci-fi adventure drama unfolds 30 years in the future, when space colonization is a reality. The story centers on the Robinson family, who have been chosen to serve as colonists and hope to make a fresh start, in a better world. After their voyage veers lightyears off course, they must learn to work together, in unsafe, alien surroundings. As a combat veteran, not to mention a father, it is a good thing that John Robinson (Stephens) has a natural ability to lead. When Jupiter 2, the Robinson’s spaceship, crashes on an unknown planet, he does his best to keep them focused. It’s not long though, before the tensions in the family bubble to the surface. Estranged from his wife, Maureen (Parker), John is only there, because he insisted on accompanying them to keep them safe. He knows it is going to be difficult to win back their trust. An astute, accomplished aerospace engineer, Maureen has high standards — at work and at home. She is the one who decided the family would embark on this trip to a better tomorrow. Maureen has always believed that you can solve any problem with the proper application of brain power and elbow grease, and she knows it’s on her to get the family off this new planet. In many ways, she feels more ready for that challenge, than she does to forgive her husband and welcome him back into the fold. Although Judy (Russell) is Maureen’s daughter from her first marriage, John adopted her and has been the only father in her life. This medical doctor may have taken her parents’ estrangement harder than anyone, and it has affected her relationship with her dad. As the snarky middle child, Penny (Sundwall) is blessed with a razor-sharp sense of humor and an independent streak. Still, on the inside, she’s much more of a softie than she lets on. She’s probably the least willing passenger on this journey and was upset about it, even before everything went wrong. Where Judy is the golden child and Penny considers herself the family’s “black sheep,” young Will (Jenkins) is the baby of the bunch. Don’t be fooled by either his size, or his age. He’s compassionate and understanding, beyond his years. A sometimes solitary, sensitive soul, who has already withstood his share of bullies, Will is just beginning to recognize the courage within himself. While he wasn’t supposed to be here, he refuses to let down the family and could end up being their saving grace. Stranded alongside the Robinsons is the rough-and-tumble blue collar contractor, Don West (Serricchio). Even though he runs a smuggling gig for extra cash, Don is all heart. He is also, though, fairly cynical. Had they not crashed, he would have taken the next flight back to earth — with a pocket full of plenty. Don is not like the Robinsons, and no one is more aware of that, than he. To him, the idea that space colonization is the key to a more equitable society is just spin; it will never benefit ordinary people. Now though, he is going to have to ally himself with this family and may wind up surprised by them, yet. Meanwhile, there is the enigma that is Dr. Smith (Posey), who stowed away on the Jupiter 2. She surely brings a lot of trouble with her, but is she a saboteur? One thing is for certain, she loves to play both ends against the middle and is darned good at it, too. Finally, there is Robot, who soon devotes himself to Will Robinson, as both a helper and a friend. Robot may well be more mysterious than any human around, and boy, is he big. If they are going to survive, this troubled troupe of fellow travelers must learn to lean on each other, trust one another and always strive toward the common good. Will they rise to the challenge? Stay tuned. What do you think? Do you like the Lost in Space TV series? Should this Netflix TV show be cancelled or renewed for another season? More about: Lost In Space (2018), Lost In Space (2018): canceled or renewed?, Lost in Space (2018): ratings, Netflix TV shows: canceled or renewed? 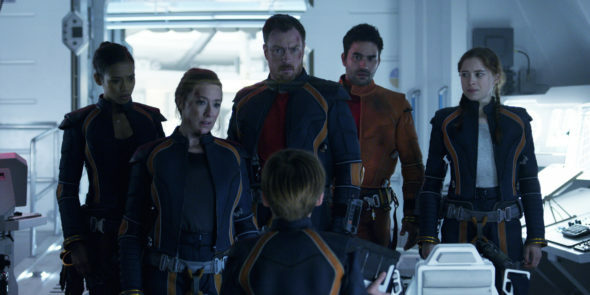 Lost in Space: Is the Netflix TV Series Cancelled or Renewed for Season Two? Awesome series, right up there with Star trek Discovery, please do not cancel. Great show, great cast, great visuals. More seasons please. JUST got hooked on it! Love it – please keep it going! I love, love, love this series…please keep it going! I love this show! Toby Stephens is awesome. Please keep it going. Really glad this show is being renewed, keep it going! Love this show and I am looking forward to next season. You have chosen an excellent cast and OMG This Dr. Smith is a Wow! The original Dr. Smith was aggravating and annoying, Parker Posey’s Dr. Smith is frighteningly, frustratingly, brilliant. Please keep it going….every awesome series of shows I get hooked on are cancelled so please keep this one going.